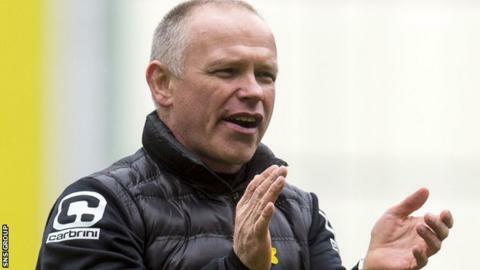 Manager of the month John Hughes has warned Inverness Caledonian Thistle that they need to bring in a better quality of player to improve standards. His side sit eighth with two Scottish Premiership matches remaining. "We've lost too many quality players in my time here and we've not replaced them," said Hughes, who has been named top Premiership boss for April. "The fans deserve for us to go and get one or two quality players for them to get excited about." The Highlanders won three times and drew once in five league outings last month but could not secure a top-six place, having finished third last season. A four-match unbeaten sequence came to an end in Friday's 3-2 home defeat by relegated Dundee United. With Caley Thistle's top-flight status assured, Hughes is trying to retain players and determined to add quality to his squad for next season - if he can secure funds to do so. "I think there's five hopefully we can get done in the dressing-room," he told BBC Scotland. "Iain Vigurs, Danny Devine, Owain Fon Williams and then the reins are on it terms of what else we're going to do. "If league position improves then the finance that comes with that will hopefully go on the budget. "You either stagnate or you move forward. There is a wee bit of to-ing and fro-ing to what direction we're going to go in." Hughes, last year's PFA Scotland Manger of the Year singled out Greg Tansey as one player he sees as vital to future success, with the midfielder the subject of a January bid by Aberdeen that was rejected. "It's imperative we keep Greg Tansey, he's a big part of it," explained Hughes. "There are too many good players left the club. "This year, I think the standard's dropped a little bit. I want to take the standard back up. "There's an understanding from me that we're not flush with cash. We have to be stringent about the way we do it. "I want to keep driving the club forward and keep getting into cup finals, into the top six. For the first time in our history, we took the club into Europe. "Why do it once and sit back and rest on your laurels? No, we want to do it every year. "That's the standard that we set, but to do that, we need to start bringing a better quality of player to the club."